A hundred years ago Buenos Aires was at its height. Argentina had one of the strongest economies in the world. Wealthy landowning families, profiting from exports to Europe, were building grand, Parisian style homes and buildings in the center of the city. Immigration was strong, as new arrivals from Italy, Spain, and elsewhere brought skills and craftmanship to the area. In turn, these immigrants developed their own distinctive neighborhoods as the city expanded its size. There is no simple way to explain why, over the course of the 20th century, Argentina would experience such dire economic and political instability. It cannot be answered by simply pointing the finger at one or two political figures or by blaming the Dirty War or the devaluation. Indeed, it seems, as if long-term economic prosperity and political stability always have been just outside of ArgentinaÂ´s grasp. ItÂ´s the unfortunate nature for history to repeat itself in Argentina. While the strong collective memory of human rights groups, led by the Madres de Plaza de Mayo, keep the terrors of the most recent dictatorship from happening again, politics are still controlled by a few provincial chieftains who govern more for self-interests rather than a beneficial society. Yet, the air of pessimism and self-doubt that pervade the consciousnous of porteños has create a vibrant cultural environment where creative pursuits in art, film, literature, and music can flourish. Equally rich are the intellectual discussions that enliven the cityÂ´s cafes and the pages of its newspapers. But behind the veneer of the cityÂ´s sophistication are the daily lives of millions who struggle to survive. Through observing what is happening in this society, we can gain a sense of what it means to be alive alive in Buenos Aires in 2005. There is no better way to understand the hardship facing Argentina than by examining the pay that people receive for a dayÂ´s work. In the northwestern town of Salta, a provincial capital, the public school teachers have been on strike for seven weekss demanding an increase in pay. The government is sticking by its offer of 300 pesos a month. The teachers union has asked for an increase to 700 pesos as the minimum monthly wage. The protests have been massive, yet the government hasnÂ´t swayed. How little is 300 pesos a month? The exchange rate is roughly 2.90 pesos to the dollar. So, itÂ´s shocking to think that teachers (on whom the future of any society depends) make no more than $100 US dollars a month. While Salta is a remote city of 500,000 at the base of the Andes, that wage is not sufficient for anyone, much less a family. Within Buenos Aires the situation is not any better. Many people work twelve hour days just to earn $8 dollars. A recent radio program discussed the lack of quality of higher education in Argentina and attirbuted it partly to the low wages of college professors (along with the huge open enrollments that overwhelm the resources of any university). A professor at the University of Buenos Aires can expect to earn $900 pesos (around $300 a month). Throughout the country workers are striking for higher wages while inflation continues to rise and threatens to grow out of control. For the first three months in 2005, inflation was 4%; annual inflation for the entire year is now expected to be in double digits, despite the governmentÂ´s forecast that inflation in 2005 would be only 8%. The government now fears that increased wages will only fuel higher prices, which is likely so but how long can this situation continue? The current government is very popular and no clear (and likely to succeed) rivals are on the horizong, but this is a condition in which the populace will not tolerate forever. And those teachers in Salta? After 7 weeks of striking, they have dropped their demands for an increase beyond $300 pesos. They must have reluctantly faced the choice that anything is better than nothing. Weekdays, San Telmo is a quiet barrio of deserted cobblestone streets that grace the edges of the city´s oldest buildings. But on Sundays, almost every tourist in town descends onto San Telmo for its famed antique fair. In its 35th year (founded in 1970 by Jose Maria Pena, director of the Museo de la Ciudad) the fair consists of hundreds of stalls setup around the Plaza Dorrego. Unlike the cross-town crafts fair taking place every weekend in Recoleta, La Feria de la Plaza Dorrego is as if the Antique Roadshow had made a stop every Sunday in Argentina. Of course, as with any such endeavor, there´s a large amount of dusty rubbage displayed for sale alongside often high quality finds. For those who like to explore flea markets and antique stores then there can be nothing better than Sundays in San Telmo. Among the offerings are old walking sticks, gaucho knives, stylishly old telephones, record players, old tango records, assorted bottles of varying colors and shapes, silverware, dishes, and jewelry. Seemingly no jewelry in South America is less than 18k gold. And platinum is quite common and silver is just dirt cheap. If the make-shift booths don´t fill your need for antiques and you still have money (or a lot of it), then San Telmo also has the best antique stores on the continent. You can imagine that so many of so many of these antiques came from the homes of formerly wealthy families, the porteño elite who, for one reason or another, had to sell off their family heirlooms. The popularity of the fair has made San Telmo not just a source of antiques. Lining the side streets off the Plaza are artisan booths. Also, further down the street, in Parque Lezama are even more artisan displays. Since San telmo on Sundays is practically the only area of Buenos Aires where you are as likely to hear English as much as Spanish, the touts are out in full force, practicing their own halting English to lure travelers into a restaurant or, worse yet, an over-baked tango show that will relieve you of the money in your wallet faster than any pickpocket. But thereÂ´s tango for free on the street. 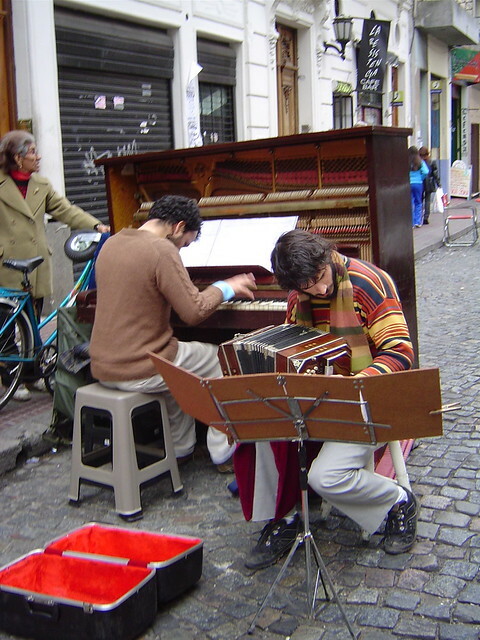 Better yet, you´ll probably come across a few young, professional musicians skillfully performing tango music on the streets. While these Sundays in San Telmo have a rather carnival feel, rather like parts of the French Quarter in New Orleans, it´s still a pleasant area to stroll around. After you tire of the antiques, walk past the mostly bad mime performers (including an older woman in a tango outfit who seems more mentally ill than artistically inclined) and find the uncrowded streets of San Telmo. A good place to stop for a meal, not far from Plaza Dorrego, is Ni tan Santo, ni tan Telmo. As its name implies, this little place at Bolivar 1112 is not so San Telmo” and occupies a nicely renovated casa. It lacks the tacky tourist trappings of several other establishments and the prices are as reasonable as any restaurant favored by the locals. It´s going on our list as a great spot to stop by for a drink, have a bite to eat, and listen to live music whenever we´re in San Telmo.